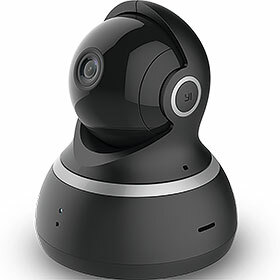 The Yi Smart Home dome camera offers HD 1080 resolution with 360-degree views and the ability to tilt and pan. The camera has a built in speaker and microphone, night vision, motion detection, and baby crying detection features. This smart home camera offers you full control and allows you to view video through the Yi app on your phone, and allowing you to see and hear what is happening in your home, day or night. • 112 degree wide-angle advanced glass lens combined with 345° horizontal and 115° vertical rotation range. • Advanced night vision with 8 built-in 940 nm infrared LED beads extend the viewing distance to 3 metres in pitch dark with no light pollution. • Responsive and advanced microphone with a built-in anti-noise filter for a clear 2-way audio. • Intercom Mode: one party to talk and listen at a time; Hands-free mode: both parties talk and listen freely. • Receive real-time activity alerts while you’re out. • 10-sec motion tracking records and centres the moving object. • Bookmark your favourite positions (up to 8) and return to them at the tap of a button. • Select Auto-Cruise to survey the area 360° horizontally or cruise your bookmarks, suitable for large areas that need a quick scan (and tracks moving objects). • Encoding: H.264 High Profile.